With Winter on our door step, its time to hunker down in your Luxury Loungewear. At Beautiful Bottoms we have a wonderful collection of sumptuous Loungewear to tempt you. From classic plain Silk Slips to flirtatious floral Silk Teddys. 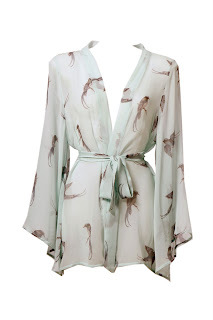 Or perhaps treat yourself to an injection of colour with the Emerald Silk Playsuit. Alternatively snuggle up with the Antique Bird Silk Robe (see below) - this is a stunning piece to get you through the chilly Winters nights.